Tan lines and sunburns are our souvenirs of summer. Unfortunately, they’re also reminders that we’ve had too much sun and the sun has damaged our skin. How does sun exposure harm skin, and what are the physiological processes that make us tan and burn? The sun gives off a kind of radiation called ultraviolet (UV) radiation. Two types of UV radiation cause skin damage: UVA, which makes skin tan and wrinkle, and UVB, which causes sunburns. Both harm skin by damaging the DNA in skin cells. Too much DNA damage can lead to skin cancer. Tanning is the first sign of sun damage. Skin cells produce a pigment called melanin, which gives skin its color and helps protect the skin by absorbing UV radiation. When the body senses UV damage, it tries to stop further damage by stimulating the skin cells to produce more melanin. Skin darkens as a result. 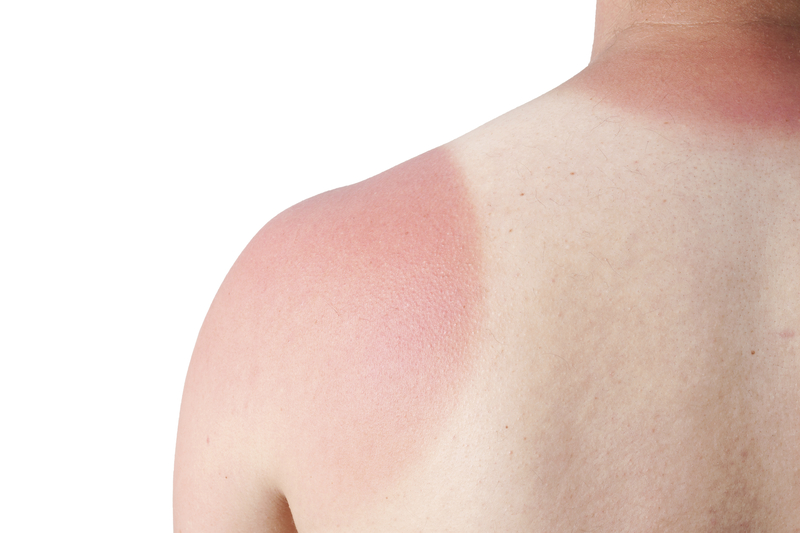 If there is too much DNA damage, the skin becomes inflamed and shows the signs of sunburn. Blood vessels in the sunburned area dilate and more blood flows through, making the skin appear red and feel hot. The immune system also releases chemicals that make the sunburnt skin swell and hurt. The skin peels to get rid of the damaged cells. Although melanin absorbs UV rays, it’s not enough to protect you from burning or other skin damage. The extra melanin in tanned skin only comes in at the SPF 2 to 4 range. The minimum SPF recommendation is 15. To protect your skin, the American Cancer Society says to slip, slop, slap and wrap: Slip on a shirt, slop on sunscreen, slap on a hat and wrap on sunglasses. Keep these guidelines in mind when you’re headed outdoors for time under the sun. Take back the memories, but not the sun!